SUMMARY: Witty review of the scientific body of knowledge on the domestic dog. AUDIENCE: A gem of science popularisation, owners who are curious about the scientific body of knowledge about dog’s behaviour, perception, etc. will really enjoy it. Be critical of a couple of controversial points (punishment and pack theory) that are presented as fact. REVIEW: I adore this book. It nearly has it all: it shows wit, critical thinking, and thorough research. He hammers down irrational beliefs with hilarious images, critical thinking and lots of references. I am dying to give it 5 stars, but it’s going to have to be 4.9999999. That 0.00000001 smidgin, tiny speck of star dust is missing because of a couple of passages. 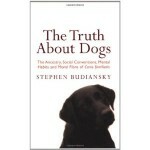 These passages would mislead first-time dog owners: the passages on dominance and punishment. In the 2002 edition, he mentions dominance in the context of ‘dogs are social climbers’ and ‘if you let up he’ll dominate you’. He goes way beyond the simplistic pack theory, so kudos there, but what remains is still speculation presented as fact. In practice, it doesn’t matter: he is making the point that dogs need consistency, and that they must look to us for what’s acceptable. I just don’t like that he framed it in the context of dominance. I was also wary of his position on reward and punishment. His views could be positioned as ‘balanced training’ (rather than ‘purely positive’). There’s nothing wrong with that. Everyone can have their opinion. But his arguments were uncharacteristically weak for a book that was otherwise so internally consistent. He posits that giving dogs treats for every good deed is less dignified than just giving them ‘quiet approval’ (or something along those lines). Well sure, it takes away the magic and mystery of dog training, but how can ‘quiet approval’ be a reward to a dog? As dogs do not have a theory of mind (the ability to imagine that someone else is thinking/feeling/knowing) how could our silent approval have any meaning? He also supports the remote-controlled electric collar, which I find a tad irresponsible given how easily it can worsen behaviour problems. Not one to end on a bad note, let me repeat myself: I loved this book. I devoured it. It was sharp, intelligent, rational, and beautifully written. Browse the Book Review archive. Genre: pop science. Author: Budiansky Stephen. Reading Level: Owners. Star: 4. Bookmark the permalink. Post a comment or leave a trackback: Trackback URL.